It was a cold january evening when I went to the bathroom and saw the last thing that any pregnant woman wants to see. Blood. I tried not to worry, knowing that spotting can occur during pregnancy, and went back to spending time with my family. One hour later, cramps, and more blood. The following hours of that night and proceeding day became a blur of ER visit, pelvic exams, ultrasounds, and tears. The doctors finally told me that my baby was gone. A “Missed Miscarriage” they called it. I had carried to 13 weeks, but my child was only measuring about 9. They explained that she must have passed away a few weeks prior, and my body was just now realizing what had happened. then came the questions, or suggestions I should say. Neither. At the time, I didn’t even realize what they were really asking me, I just knew that I didn’t want any more interventions. I knew I didn’t want anyone else touching me or my baby. My doctor awkwardly patted my shoulder and explained that if I wanted to do this naturally, I could expect a week or so of bleeding and maybe some “tissue paper like” substances. They then sent me home. This ended up being so far from what I truly experienced. I began that initial alarming bleed on a sunday. It continued at the rate of a light period until tuesday evening. Around 6PM I began having cramping. It started mild, but progressed over the next few hours into painful contractions. The contractions got more intense and closer together. I have had a healthy labor and delivery before, so I know what labor feels like. I was in labor. I checked my dilation, and my cervix was, indeed, dilating. Eventually I had that familiar urge to bear down and push. So there, in my own bathroom, I delivered my tiny baby. Tears and silenced followed as I was able to hold my child. Although we will never know for certain, in those moments I felt that my little baby was a baby girl. I decided to call her Lucy. I called to my mother who was there at the time, to get me a box and a cloth. I was able to wrap my sweet baby in a small cloth and place her in a box, knowing that she was perfect, and mine were the only hands that had ever touched her. Those few moments of indescribable love and grief were spent alone, in my own home. The pain of labor was eased by the comfort of my own bed, and the loving embrace of family who was with me. My memories of the event are painful, but peaceful. If we are level headed and take emotion out of the picture, 99.999999999999% of the time, the doctors are right. But asking a grieving mother to be level headed is like asking a fish not to swim. It isn’t realistic. Allowing my body to show me eliminated, at least one, of those what ifs. This one is coming from a mama who suffers from endometriosis and has been through every medical intervention on the market to prevent it from causing infertility. Eventually, I had to say “no more”. I felt over medicated and tired. After 9 months medication free, we conceived our first child, a beautiful healthy girl, now 18 months old. This informed my decision to allow nature to take its course. During a D&C, doctors remove your uterine lining in its entirety. Many, many women go on to have wonderful healthy pregnancies after this procedure, but it has been known to lead to some minimal scarring of the uterus. For someone like me who has some scarring to begin with, this was not a risk I was anxious to take. It also means that the return of your period can be prolonged as it takes time for your body to build up the uterine lining again. With natural miscarriage, your body sloughs off only what it needs to, allowing your cycle to often return to normal quicker. This may not be of any consequence to you, but I was anxious to have my body back into it’s normal rhythm. This one was of the very highest priority for me. when you suffer an early miscarriage, many times you do not have the opportunity to see your child as I did. But sometimes you do get that opportunity. Either way, there will always be recognizable tissue. After delivering my girl, I had no idea what to do. I was left googling, with little to no luck, on what to do with the body of an unborn child. You will find that there is very little respect for this sort of situation. If you have found this article because you are in a similar situation, I am so very sorry for your loss. I was finally able to locate some laws and procedures on what your options are. 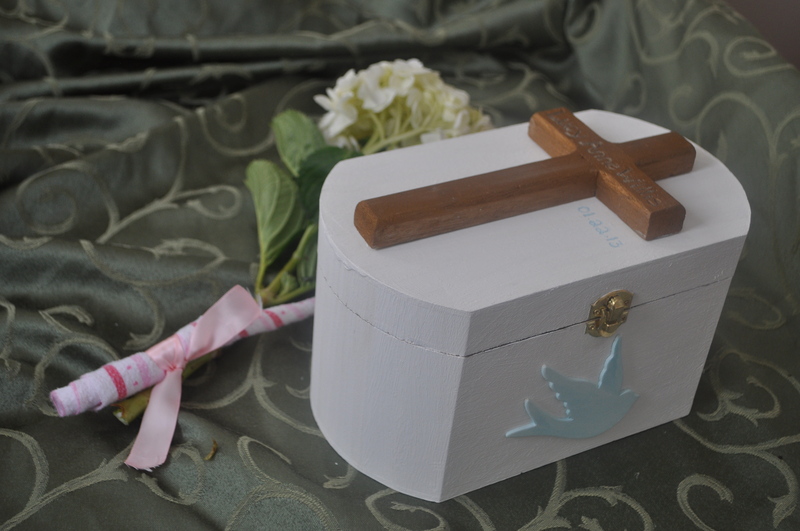 If you have the baby in a hospital, or choose a D&C, some hospitals will allow you to take the remains to be buried (if the child is less than 20 weeks gestation). If you do not ask, they will be burned with the medical waste. If you miscarry at home, a baby less than 20 weeks gestation, you are lawfully allowed to bury him or her yourself. If you choose to bury your child on your own property, that is your right. If you would like your child buried at a cemetery, and you have a family plot, you can place the remains of your baby in your family plot. If you do not have a family plot, you can visit your local catholic cemetery. Every Catholic cemetery has an area, or children’s garden, where they will bury the remains of unborn children free of charge to the parents. All they require is a note from a doctor saying that what you are asking to be buried is the remains of a miscarriage. We were able to have a beautiful ceremony at the cemetery, at which our priest was present. He read a few passages, and we lowered the tiny homemade casket into the ground. Our older daughter placed a rose on her sister’s grave and we went home, feeling an undeniable sense of peace and closure. “I knew you before I formed you in your mother’s womb. Before you were born I set you apart” . Regardless of the method of miscarriage, our beloved children are now at peace. Take comfort knowing that wherever they are, they spent the entirety of their lives in the warmth and comfort of your loving embrace, and drifted into eternal sleep to the steady beating of your heart. Beautiful words Sarah. I pray God blesses you with another child in the future. You are an awesome mama and they would be so lucky to have you. At 21 weeks we were told, in a busy city hospital, to terminate the pregnancy as there was no chance of survival for the fetus. I can remember, like u, feeling numb and disassociated from the dialogue. The doctors gave us an hour to decide! We went to a nearby coffee shop. We were 6 hours from our country home. James suffered from fetal banding, where interior womb bleeding thickens into a rope like substance and can tangle the baby up, leading to limb amputations and death. James was covered in fetal bands. We didn’t know what to do, our combined faith, led us to the decision we made. That was to go home and see what God decided for him. The doctors were unhappy, as they said I may hemorrhage and bleed to death. I lived about 1 minute from the local hospital, so took the chance. I gave birth to my sleeping child 4 weeks later. Thanks so much for sharing this post. I know we are a special group, we mothers who have held our tiny babes in our hands. Saying goodbye to a future we can only imagine. Hugs.